Research has found that both exercise and sleep can improve attention, mood, executive function, and self-regulation. Research has found that two thirds of children with ASD have sleep problems, fragmented sleep, and early awakenings. So be aware that many of our students can be fatigued by early afternoon and may benefit from easier, more repetitive learning tasks in the afternoon. On my Facebook page I recently did a Poll which 1,540 people voted. Remember different strategies work for different children, and if one strategy doesn’t work, try another. Set up a good bedtime routine. Use timers/clocks/sensory tools. Teach to stay in bed even if not sleeping. Epsom Salts, Bath or Lavender. Turn off all “blue screens” (iPads, TVs etc.) at least onehour before sleep. Accept lack of sleep can be related to anxiety levels sothey may need time to pace. Check for food allergies particularly gluten intolerance. TV in room with a timer on it so it turns off. Sleep on floor next to their bed (rather than them coming into your bed). Wind them down early and have a calm routine. Stories in softly lit room and cuddling. Social script that explains why people and family need sleep. Try wrapping the child in his sheets or blankets. He may need the restriction around his body to feel comfortable. Earn reward points for staying in the bedroom. The benefits of exercise and overall fitness are well known for improving general health, mood, and stress management. Fitness is associated with better working memory, response inhibition, and learning in students. Playgrounds: Monkey Bars, Swings, Obstacle Courses. Personal Trainer (many families find this very helpful once a week). Gym Equipment: Treadmill, Rowing Machine, Punching Bag, etc. This book provides key strategies for all ages and stages. It offers over 500 practical strategies and time savers for school and home. Everything from setting up a classroom, developing friendships, engaging disengaged students, to moving house, choosing a school and applying for a job. 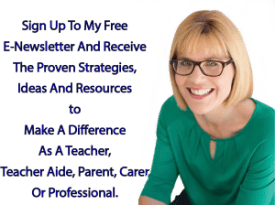 It is the ultimate guide for teachers, parents and all professionals supporting children with autism spectrum disorder, including Aspergers, ADD, ADHD, ODD and other developmental delays.